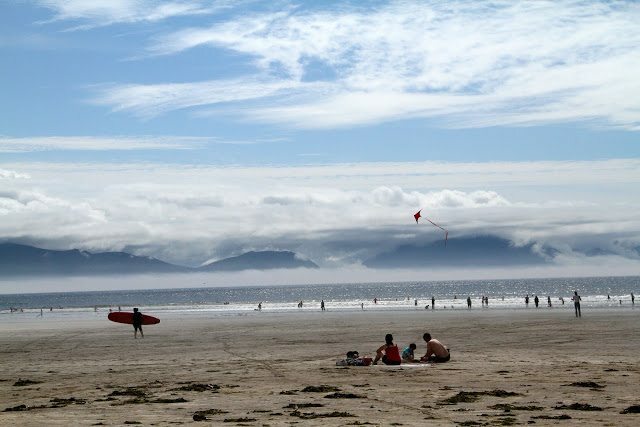 There were 5 kinds of weather in that sky and the mist hanging over the mountains made the beach disappear in an endless haze. Sun filtered through from time to time and the surfing classes, picnics and family gatherings continued, in spite of sprinkles of rain, thickening fog or sand blowing…..
We could no longer resist a dip in the Atlantic. Balmy salt water and soft waves. An eery light that made the whole of Inch Beach look like an alien planet. I let the sea water and the dramatic ocean bay of weather sweep over me. The silky sea, the cool sparkly dazzle, the dark mountains and those busy beings like so many ants, undertaking a thousand happy tasks………and in no time, I began to forget……. Mimo iż pogoda się zmieniała, to Atlantyk pozostał piękny. Pozdrawiam. Even though the weather changing, it remains a beautiful Atlantic Ocean. Yours. Big wave Giga, and thank you for your comment. Yes the Atlantic Ocean never fails to impress on any day! 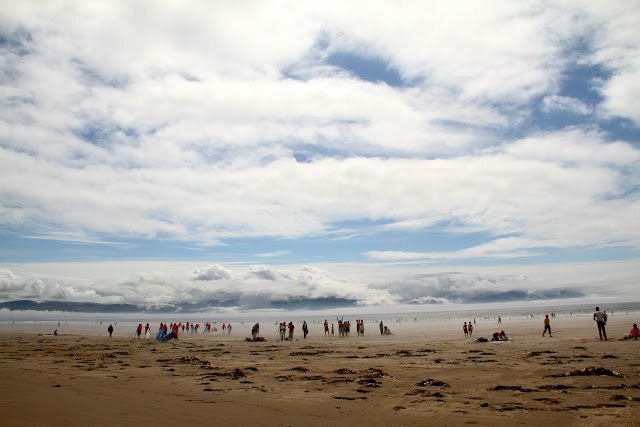 I was lucky enough to see Inch Beach when we visited Ireland a few years ago. It's a stunning spot. I was amazed at the number of cars parked along the beach and the number of surfers out on the waves. We were there on a beautiful sunny day and the sea seemed to stretch on forever. These images are beautiful – I was captivated by the first one. I have never been to Ireland but now feel I need to. 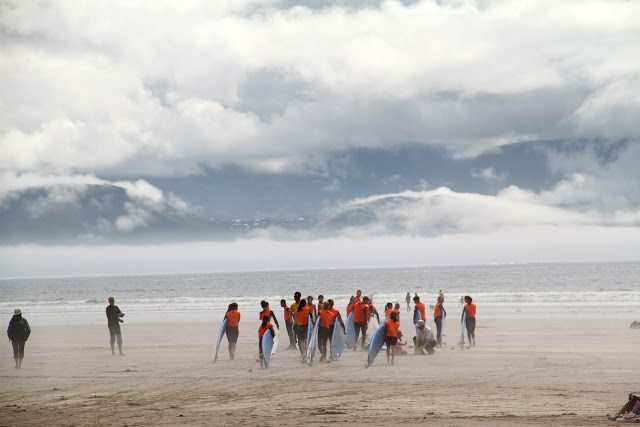 love the pictures and how you have captures the soul of Inch and the mystical County Kerry. 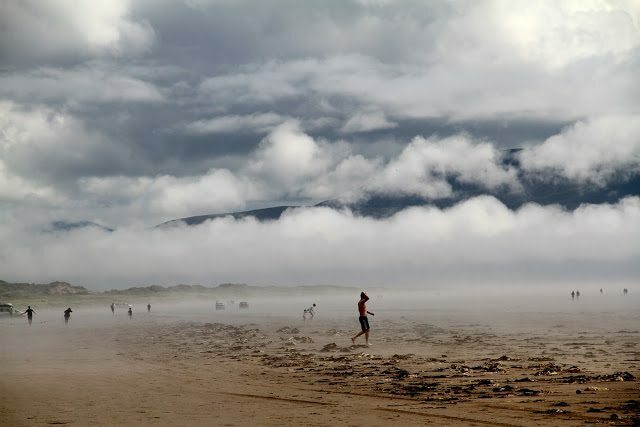 These are really atmospheric photos – Ireland is such a beautiful country especially Co Kerry. Those are such stunning photographs of the sea. I love the first one especially, it must have been wonderful to be there to witness it. If I didn't know I was looking at Ireland I would not know since we do not see your lovely beaches often as tourists…I must be sure to remedy that on my next visit. I love the changes on the beach shown in those amazing photos…I do so love the beach and the feel of the ocean…it does make one forget…oh to live near the ocean! Thanks Donna, it really washes over us and takes the cares away….sighs….. Wonderful place …. and the clouds just amazingly formed …. Great to see you breaking out and shooting people (photographically)…the mist effect is great and gives an intriguing added ambience. That light is the most beautiful of all. Love how it ebbs and flows and changes. The sky is absolutely gorgeous!! !